Tiny Striker presents players with a simple challenge: kick the soccer ball (or football) into the goal. It's a simple matter of swiping the screen to kick, but the way the screen is swiped is actually very important. You'll need to learn control in order to win matches and grab the occasional gold coin. There are a fair bit of things you can tweak off the field to give yourself an edge. Train up your skills. You can increase your striker's Power and Curl from the menu. It doesn't cost anything to start training, but it will cost coins if you want to speed the process up. Get some cards. Cards that will temporarily boost your Striker's abilities, as well as provide other benefits such as wind reduction or prevent goalies from moving, can be bought for coins. Each card has a set number of uses before it expires, but you can always buy more if needed. Choose a sponsor. Sponsors are always worth having - they grant a permanent bonus to your striker for as long as you're paired with them, and they'll sometimes give you challenges that will earn a fair number of coins upon completion. Transfer to new teams. As you climb the ranks you're going to want to transfer to higher ranked teams, which can be done from the Striker menu and will cost more coins the higher the rank. Customize your striker. This isn't essential to the game and it won't improve your chances at all, but you can edit your striker's name and appearance for a bit of a personal touch. When all is said and done, everything still boils down to how well you can aim your kicks. Aiming is tricky but do-able. It takes some getting used to, and the responsiveness will change as your striker's curl improves. Practice makes perfect, of course, but in my experience you're better off using smaller swipe adjustments rather than large, sweeping ones. More goals is better. Above all else, if you want to win a match you need to score a lot of goals. This should be your main focus until you get used to the ball handling. Go after coins. Not only is trying to angle your shots to snag coins good for getting more coins (duh), it's also a good way to practice more involved ball curling. This will be extremely useful once you start going up against tougher teams with trickier defensive lines. Accuracy matters. 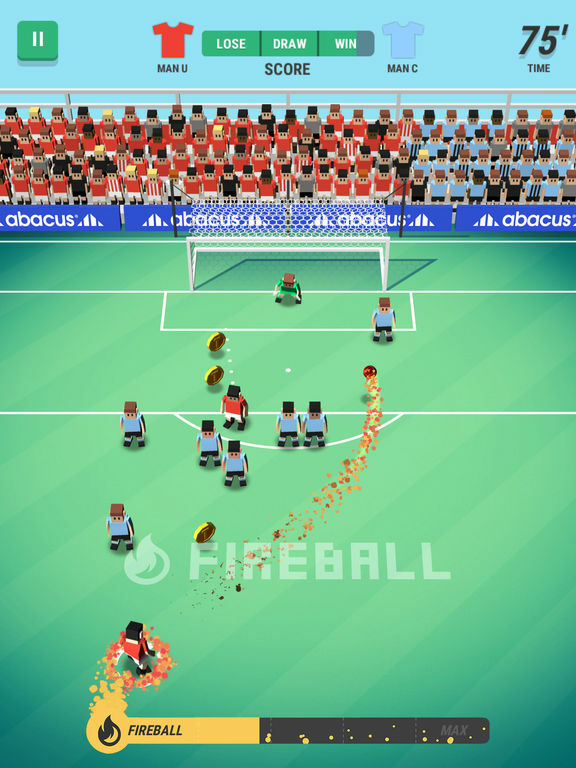 Successfully scoring multiple goals without missing will build up a meter that will eventually grant you a Fireball for a few seconds. The Fireball is great because it can plow right through defenders while also giving you additional striker experience for each defender you knock over. Goalies will still stop it though, so be mindful of that. There isn't a whole heck of a lot to Tiny Striker, but that's just fine. It's simplistic but fun, largely thanks to the way it forces you to act fast rather than take your time. Well worth the price of free if you ask me. Speaking as someone who's not big on sports games (except for stuff like Mutant League Football or Basewars), I do appreciate how so many mobile games try to distill basic sport concepts down to enjoyable bite-sized chunks. 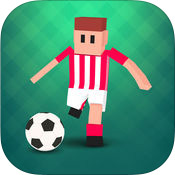 Such is the case with Tiny Striker, where a game of soccer/football has been stripped down to a simple matter of swiping on the screen to kick a ball at a goal. I've been enjoying it quite a bit, actually. 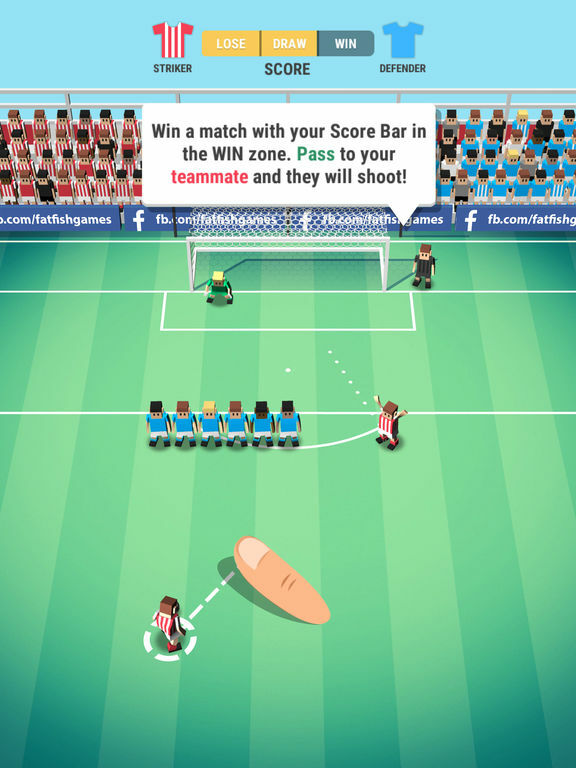 Everything about Tiny Striker boils down to swiping for goals. Rather than running around a field, everyone just sort of stays where they are for the most part - barring the occasional goalie who crab-walks back and forth in front of the net, anyway. Your task is to kick the ball so that it goes into the net, obviously, but you have a little more control in that you can curve the ball to pull off impossible trick shots. I'll admit that it takes a bit of doing to get used to how the ball curving works (more precise kicks took some practice), but it's a fun little idea that's quite enjoyable to pull off. It's even more satisfying once you start factoring in the various wrinkles in the formula, such as threading the ball through a tricky lineup of blockers in order to snag coins, or scoring multiple goals in a row in order to be 'on fire' - then using the on-fire ball to kick straight through defenders. My favorite part of it all is how each match is on a timer. You're kind of competing with the rival team, and over time they'll start to wrest the win away from you. The only way to keep that from happening is to score lots of goals faster than they can (off screen, I should note). It's such a basic concept but I really appreciate how the need to go fast makes scoring more of a challenge because you only have a few moments to figure out how you want to take any given shot. I mean you could take your time with it, but that runs the risk of either tying the game with the other team - or worse, losing outright. Then there's Tiny Striker's freemium-ness, which is shockingly lenient - perhaps too much so. The coins you earn from leveling up, finishing games, grabbing with the ball, etc are used for everything, including refilling stamina meters. This means that patient players don't really have much incentive to pay at all. It's great from a consumer standpoint, but I worry that it means Fat Fish won't end up receiving appropriate compensation for making an enjoyable game like this. I mean I suppose it does stink when the energy meter runs out, because it means I can't keep playing, but when I can buy refills with in-game currency it's sort of moot. As a cute and simple distillation of soccer/football, I'd consider Tiny Striker a winner. It's easy to jump into, satisfying to play, and rewards skill without being too punishing against those who might need more practice. Definitely one worth checking out.